America’s founding history can be prefaced with this quote by Calvin Coolidge, our 30th President: “To live under the American Constitution is the greatest political privilege that was ever accorded to the human race.” Our founding history is one that ultimately produced the most perfect national Constitution in the world and the template most friendly to human liberty. Our history is defined first by those brave men and women who braved rough seas and a hostile new continent to start colonies where they could worship freely without prejudice or oppression. These early settlers came mainly from England where subjects were forced to respect the state church. For our benefit, they established colonies on English law and established the notion of religious freedom. While memory has faded and we tend to forget the sacrifice these men and women made to settle this country, including the ravages of disease, famine, and hostile Indians, we feel more of a connection to our Founding Fathers because even today, we feel the impact very much of their contributions. Everything we enjoy today in this country is a gift from our Founders. And if we would have listened more closely to their warnings and admonitions, we would be enjoying even more freedom today, especially with respect to religion, property and opportunities in the marketplace. Although it is discouraged in the public school system, how often do young people, and even their parents, take a moment and reflect and Thank God that out of all the miserable places in the world, they were blessed to be born in the United States? First, let’s meet our Founding Fathers. diplomats or even ordinary citizens, helped initiate the cause for our independence and helped secure our victory in the Revolutionary War. Many of these men pledged their “lives, property, and sacred honor” and put their lives on the line as “traitors” to the Crown so we could have our independence. The brilliance of our Founders is second only to the bravery and determination they showed, and they deserve our respect and gratitude. Theirs is a debt that at the very least we can repay by being educated on their contributions and on our founding history. (1) He initiated the Constitutional Convention in Philadelphia in 1787 and convinced George Washington to preside over it. (Without Washington, it was very likely that the other states would not have taken the Convention seriously and would not have sent delegates). Federalist Papers – to explain in detail how limited the federal government would be and how it would be restrained, and to reassure the states that they would retain their sovereign power. The Federalist Papers were essential in convincing the states to ratify the Constitution. (5) Finally, James Madison became convinced, after Jefferson pressured him, that a Bill of Rights was necessary. He drafted them – modeling them closely after Virginia’s Bill of Rights (called the “Declaration of Rights”), which were written by George Mason. Thomas Jefferson – from Virginia It is most likely that Thomas Jefferson, of all the other Founders, whose intellect and vision contributed most to our founding documents. (1) He was the author of the Declaration of Independence. (2) Even before the Declaration, he wrote A Summary View of the Rights of British America in 1774, which laid out a set of grievances against the King for delegates to the First Continental Congress. He wanted it sent to King George III, on behalf of the Congress, to appeal to him to intercede on behalf of the colonies and to treat them with the same respect shown other English subjects. structured and he was able to influence the deliberations at the Convention through a steady stream of correspondence. Convention. And by 1788, he finally convinced Madison of the need for it. As I said earlier, George Mason wrote Virginia’s Bill of Rights on which our Bill of Rights was fashioned. But Mason himself fashioned Virginia’s Bill of Rights after Jefferson’s own Virginia Statute for Religious Freedom. (8) Sadly, Jefferson died financially destitute, but paid off many of his debts by selling his book collection to Congress for $25,000 (about half million dollars in 2010). His books were used to begin the Library of Congress. TRIVIA: Both Thomas Jefferson and John Adams died on the same day – July 4, 1826, the 50th anniversary of the ratification of the Declaration of Independence. (3) Washington was the Commander of the Continental Army which defeated the British forces in the Revolutionary War. (4) When asked to preside over the Continental Congress as its president, he willingly accepted, even though he was suffering from debilitating rheumatoid arthritis. He understood firsthand how important it was to address the limitations of the Articles of Confederation because as Commander of the army, he had to plead and beg the Continental Congress for years to provide food and supplies for his men and to pay them. (it’s a miracle most of the men continued to fight without that support). (5) When the time came to select a President of the new United States, his countrymen called on him again, with a unanimous voice. It was fitting that he would be our First president. (6) In public life, he defended religion and morality as what he called the “twin pillars” of a free society. TRIVIA: Washington was the only president elected by unanimous vote of the electoral college. especially credited for writing the Preamble, which he drafted almost as an after-thought. He wanted to include a statement setting forth the reasons for the Constitution. John Adams – From Massachusetts – Adams was a lawyer and a brilliant writer and thinker. (2) He was appointed to the Committee to write the Declaration of Independence and it was assumed, with his skills, that he would write it, but he convinced Jefferson to write it instead (telling him that he was a far better writer than he). (3) Although he was abroad at the time of the Constitutional Convention (as ambassador to Great Britain), he wrote a pamphlet called “Thoughts on Government,” which was very influential to the framing of the Constitution and the design of the government. It advocated for a government of limited powers and one based on a clear separation of powers. (1) He headed the Sons of Liberty and was the principal planner of the Boston Tea Party. (The “Sons of Liberty” were a group of political agitators who formed in opposition to the Stamp Act and to Britain’s taxation of the colonists without representation in Parliament. Groups existed in every colony. The reason they formed was to force those who distributed the stamps and collected the tax to resign. It was a form of protest against England). (3) Many of Massachusetts’ revolutionary documents, including the famous “Massachusetts Resolves” – which encouraged colonists to protest over Taxation without Representation – were written by Sam Adams. (4) Although he lacked oratory skills, he is considered one of the most influential political writers of his time. (5) Sam Adams is principally responsible for the creation of a Constitutional Congress. Benjamin Franklin – From Pennsylvania – Franklin possessed more than just an ordinary genius. (1) It was Franklin who first proposed, in 1754, that the colonies collaborate for mutual benefit. (This collaboration would be the precursor to the Articles of Confederation which was drafted in 1776-77). The “Join or Die” flag (the severed snake) was designed by Franklin to show the signify the importance of the states joining together. (2) He was this nation’s first minister to France and helped forge a crucial alliance with that country which helped us win the Revolutionary War. Washington could never have defeated Cornwallis at Yorktown without the naval blockade provided by the French and the troops it sent. (3) At the age of 81, Franklin was the senior statesman of the Constitutional Convention. Because of his age, experience, diplomacy skills, humor, and out-going personality, his particular role was that of diplomat. (4) He was also was one of the architects of the compromise between large states and small states on how states would be represented in Congress and how the final government should be structured. Alexander Hamilton – From New York – One of the most vocal and active debaters at the Constitutional Convention. (1) Unfortunately, his view was the least tolerated. He urged a national government based on the British model – a strong, centralized Parliament and a King (he called it a Governor) who would be selected, not elected, for life. He wanted to strip the states of their power. (2) Hamilton ended up contributing very little to the final product. (3) However, in the struggle for ratification by the states, Hamilton became a champion of the new Constitution. Like Madison, who also didn’t get his way, Hamilton became a staunch supporter of the Constitution when it seemed likely that the states wouldn’t ratify. He went on to write the Federalist Papers with Madison and John Jay and played a pivotal role in helping to sell the Constitution to the states and getting it ratified. (5) Unfortunately, as important as Hamilton was in getting the states to ratify the Constitution, he is remembered as the founder responsible for the government’s broad power to tax and spend. As Washington’s Secretary of the Treasury, he enunciated the clearest argument ever made for a liberal construction of the Constitution, which the progressive Supreme Court at the time quickly picked up on. [US v. Butler (1936)]. (1) Mason wrote the Virginia Declaration of Rights (1776), which provided the template (and in good part, even the very language) for our US Bill of Rights. (2) He fought hard to abolish slavery with the adoption of the Constitution. In fact he refused to sign the Constitution because it did not outright abolish the slave trade. The compromise, embodied in Article I, Section 9, clause 1 was not good enough for him. (Article 1, Section 9, clause 1: Congress was forbidden to abolish the slave trade in the US until 1808. It was primarily Georgia and South Carolina which negotiated this compromise. They wanted at least 20 years to transition from slavery). John Jay – From New York – Jay was a respected lawyer. (1) He served as one of the early Presidents of the Continental Congress (in 1779). (2) His greatest contribution was in joining with Madison and Hamilton to write the Federalist Papers. (3) Jay went on to become our nation’s first Supreme Court Chief Justice – appointed by President Washington. Thomas Paine – Born in England, Paine settled in Philadelphia and became a journalist. (1) He is one of the greatest political thinkers of all time. (3) He wrote Common Sense and the Rights of Man. Common Sense, which was written before the Declaration of Independence, challenged British rule and called for a separation from England. It was such a powerful document that the Revolution became inevitable. In fact, General Washington read it to his men while they were encamped during the war. Its discussion of liberty inspired all of our national founding documents. (4) It is probable that we would never have had the Revolution if it weren’t for Tom Paine’s writings. (1) He was a member of the Sons of Liberty and pushed for independence from England. (2) Madison asked Henry to attend the Constitutional Convention as a delegate, but he turned down the invitation, claiming: “I smell a rat.” (He was probably referring to Hamilton, or even Madison himself). He suspected that the Convention would do more than simply amend the Articles of Convention and instead, completely overhaul the federal government. He feared they would try to make it more powerful, thereby erodin individual liberty and destroying the sovereignty of the states. (3) Ultimately, however, Henry became one of the most vocal proponents of a Bill of Rights. He argued that if the states were going to adopt the new Constitution, it at least ought to be guarded by a Bill of Rights. the cause for our independence and initiate the war itself. gunpowder from the British and after they learned that the colonists were stockpiling ammunition and were planning a revolution. Adams and Hancock were suspected. The soldiers planned to raid the weapons depot and then capture Hancock and Sam Adams. It was Paul Revere and his midnight ride that warned them but ended in the Battle at Lexington where the first shot of the Revolutionary War was fired]. (1) Served as President of the Continental Congress under the Articles of Confederation. (2) As we’ll learn later, it was Lee who introduced a formal resolution on June 8, 1776 to the Continental Congress to draft a Declaration of Independence. (3) Lee opposed the Constitution of 1787, which in his opinion dangerously concentrated power in the federal government. He publicly criticized the Constitution through his essays in a Virginia publication under the title “Letters from the Federal Farmer.” [Those that supported the new Constitution were called “Federalists” and those who opposed it were called “Anti-Federalists.” The “Letters from the Federal Farmer” were part of the Anti-Federalist Papers, which prompted the writing of The Federalist Papers, which are the essays providing a detailed explanation of the Constitution]. (5) He was the great uncle of General Robert E. Lee. In talking about our Founding Principles, it’s important to first understand that to a large degree, our founding documents are based on English law and English tradition. That’s because English history is OUR history. forefathers developed laws for the colonies, and then drafted Constitutions to announce their independence as sovereign states, they incorporated the liberties guaranteed by the great English documents including the Magna Carta and the English Bill of Rights. The history of England began with the Anglo-Saxons — Germanic tribes that migrated to the English isle from Germany and southern Scandinavia. They populated and ruled England from about the 5th century to the Norman Conquest in 1066. In 1066, England’s king Edward died – without any heirs. The Normans invaded England because its king, King William, had a legitimate claim to the throne. With this invasion, Anglo-Saxon rule was replaced with Norman rule. (Normandy is the northern area of France). Anglo-Saxons were reduced to peasants in their own country and denied the rights that had once protected them as English subjects. For over 100 years – that is, until 1215 (with the signing of the Magna Carta) – the people of England tried to get back the laws that had protected them before the Normans took over. In 1215, the Magna Carta was signed by King John to acknowledge the “rights of all freeman.” King John was a tyrant king during the Medieval era who abused his power over his subjects – mainly the feudal barons. The barons rebelled and King John was forced to concede to their demands. The barons drafted a charter resurrecting historic English rights and they forced King John to sign it. Originally, the charter referred to “the rights of barons,” but was then changed to “the rights of all free men.” King John fixed his official seal to acknowledge that the charter was the supreme law of the land and from that point on, it became known as the “Magna Carta” or “Great Charter” of liberty. [Note: Feudal barons were a low-ranking class of nobility that received large grants of land in return for a pledge of loyalty to the King – which meant they would provide the King with money (tax revenue) and men for battle]. Besides the actual rights set forth in the Magna Carta, the document was especially significant because it demonstrated that the power of the king could be limited by a written charter. Other important historic English documents include the Petition of Right, the Habeas Corpus Act and the English Bill of Right. does this sound like?) The Petition was also most notable for the following: (1) taxes can be levied only by Parliament, (2) that martial law may not be imposed in time of peace, and (3) that prisoners must be able to challenge the legitimacy of their detentions through a writ of habeas corpus. The Petition of Right is the reason the colonists became so enraged over “Taxation Without Representation.” The colonists, who saw themselves as English subjects – believed if taxes were to be levied by Parliament on them, they had a right to have representation there. The Habeas Corpus Act (1679) – This was adopted by Parliament in response to a multitude of abuses of detained persons. The Habeas Corpus Act would become our Fifth Amendment. Immediately, Parliament became functional again and it drafted a Declaration of Rights. Before formally offering the throne of England jointly to William and his wife Mary, Parliament demanded that they sign it as part of their oaths – which they did. From that moment forward, it altered the balance of power between the King and his subjects. The power of the King would have limits. Kings and Queens would be subject to laws passed by Parliament, they would respect the rights and liberties of English subjects, they couldn’t suspend laws, and they would respect the fact that Parliament alone has the right to levy taxes (so no arbitrary taxation). As you can see, with all these documents – from the Magna Carta to the English Bill of Rights – the English were constantly forcing limits on government power. Each document was a restatement of Individual rights as with respect to government. And this is the history – the history of individual liberty – that our early settlers brought with them to America. This will help you understand why the colonists sought their independence and what our early Americans expected from their new government. came to America and settled the Massachusetts Bay Colony. While onboard their ship their leader John Winthrop delivered a sermon referencing the gospel of St. Matthew and pledging: ”We shall be as a City upon a hill – the eyes of all people are upon us…” He was referring to the fact that America would be God’s Country and because of that, it would be an exceptional nation. colonies – only charters for land (in return for trade opportunities). In fact, from 1650 on, England instituted a series of laws of trade and navigation known as the Navigation Acts. Their purpose was to limit colonial trade to the British only, but they were enforce loosely. Only when the colonies became productive did England take particular notice and begin to impose its policies. From that point on, the colonies were on a collision course with the British and war was inevitable. The collision course effectively began when the British defeated the French in 1761 in the French-Indian War to rid the northern colonies of the threat that French settlers posed. There was the Tea Act, of 1773, which imposed a heavy import tax on tea and allowed the India Tea Company to have a monopoly to supply the colonies. Approximately 50 members of the Sons of Liberty protested with the Boston Tea Party. Parliament retaliated with the Intolerable Acts of 1774, which: (1) stopped all shipping in Boston Harbor until Massachusetts paid the taxes owed on the tea dumped in the harbor and also reimbursed the East India Company for the loss of the tea; and (2) Put Massachusetts under military rule. the insult, it was an added expense to them). Colonial legislatures were disbanded and colonial laws were suspended. British troops raided, seized, and destroyed colonial property and attempted to arrest agitators, like Sam Adams and John Hancock. Sense and Sam Adams published his pamphlet, “The Massachusetts Resolves,” and Patrick Henry was delivering fiery speeches urging “Give Me Liberty or Give Me Death!” [Many in our lifetime can remember how stirring Martin Luther King Jr.’s “I Have a Dream” speech was. So we can imagine the impact of Patrick Henry’s speech]. Finally, on June 7, 1776 – Richard Henry Lee presented a formal resolution to the Second Continental Congress calling for a declaration of independence from Britain. On June 11, the Committee was appointed. The French-Indian War ends (1761) – In 1761, the British defeated the French in the French-Indian War. (The French had posed a military threat to the northern American colonies). Parliament passed on the costs of that war to the colonists, and they thought it only fair. Stamp Act Congress (1765) – representatives from 9 colonies prepared a resolution to be sent to King George III and the English Parliament, listing the rights and grievances of the Colonies and demanding the Stamp Act be repealed. The Declaratory Act (1766) – the same day the Stamp Act was repealed, Parliament adopted the Declaratory Act, which declared that Parliament had total power to legislate any laws governing the colonies in all cases whatsoever. Boston, the soldiers opened fire on them. Ironically, it was the brilliant attorney, our own John Adams, who got the soldiers acquitted. The Tea Act (1773) – imposed a heavy import tax on tea and allowed the India Tea Company to have a monopoly to supply the colonies. The Coercive Acts (aka, the Intolerable Acts (1774) – (In retaliation for Boston Tea Party) With these acts: (1) All commercial shipping in Boston Harbor was stopped until Massachusetts paid the taxes owed on the tea dumped in the harbor and also reimbursed the East India Company for the loss of the tea; and (2) Massachusetts was put under military rule. British General Thomas Gage, commander of all British military forces in the colonies, became the new Governor (thus ending colonial rule). More Quartering Acts (1774) – required colonists to shelter and feed more British soldiers. England sent more soldiers for the purpose of enforcing the Intolerable Acts. King for delegates to the First Continental Congress. colonies sent delegates except Georgia. They declared the rights of colonists to Life, Liberty, and Property. midnight and warned Adams and Hancock who were hiding out there. 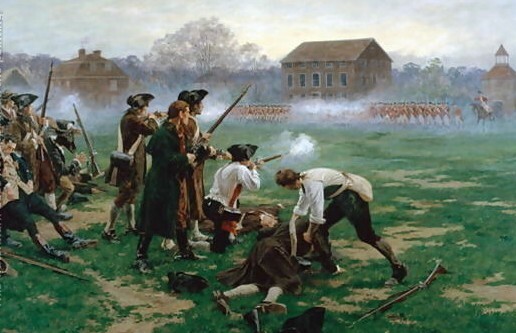 “One if by land and two if by sea.” By dawn the following day, about 70 armed Massachusetts militiamen stood face-to-face with the advancing British guard on Lexington Green. An unauthorized shot was fired – “the shot heard around the world” – and thus began the American Revolution. Thomas Paine’s Common Sense was published (Jan. 9, 1776) – He wrote: “A government of our own is our natural right….. We have every opportunity and every encouragement before us, to form the noblest, purest constitution on the face of the earth. Resolution Presented for a Declaration of Independence (June 7, 1776) – Richard Henry Lee presented a formal resolution to the Second Continental Congress calling for a declaration of independence from Britain. After introducing his resolution, Lee stood up and said: “Why delay? Why still deliberate? Let this happy day give birth to an American Republic. The eyes of Europe are fixed upon us: she demands of us a living example of freedom…. She invites us to prepare an asylum, where the unhappy may find solace, and the persecuted repose….”. Committee Appointed to Draft Declaration (June 11, 17760 – Congress appointed a Committee to draft a Declaration of Independence. Lee was appointed to prepare the draft. Richard Henry Lee was appointed the task of drafting a Declaration, but his wife fell ill and he returned home to Virginia, leaving the task to Benjamin Franklin as the most senior and experienced statesman. But pushing 70, he was not feeling well. Next the task fell to John Adams, but Adams knew Thomas Jefferson was a much finer writer and so, as fate would have it, he was able to convince him to prepare the draft. In preparing to write the Declaration of Independence, Jefferson looked to the Magna Carta and to the English Bill of Rights.. The Magna Carta, for inspiration on how to assert individual liberties, and the English Bill of Rights, for how to explain the reasons for separation from England. And that, in good part, explains the Declaration…. usurpations, all having in direct object the establishment of an absolute Tyranny over these States. To prove this, let Facts be submitted to a candid world. I don’t think anyone has asserted individual liberties so magnificently and eloquently as Jefferson did. [Note that the significant difference or improvement over the English documents is that our Founders announced that our fundamental rights are endowed by our Creator]. On July 4, the Congress formally endorsed Jefferson’s Declaration. The actual signing of the Declaration of Independence occurred on August 2, when 56 members of Congress placed their names on the historic document. They signed this Declaration even though we were still at War with Britain and unlikely to win. They signed this document even though they knew that if the war for independence was not won, they could be tried for treason by England and executed. practice the values set forth in the Declaration. atheist groups hate it. They are trying to remove it in every form possible and from every place they can. It is not a statement of theology, but a statement of the ordering of rights and liberty. This one sentence in the Declaration of Independence would become the very foundation of our Constitution and our system of government and the very basis of our rights and liberties. It reflects our nation’s heritage. The Constitutional Convention (also known as the Philadelphia Convention) took place from May 25 to September 17, 1787. Its purpose was to address problems in governing the United States under the Articles of Confederation. But certain leaders at the Convention (namely, James Madison and Alexander Hamilton) had other plans for the event: They wanted to start from scratch and create a new government that would be more effective. Although not all the states were not unhappy with the Articles, after discussion began, they all came to agree that a new governing document was in the nation’s best interests. (that’s not to say that several elements of the Articles didn’t make it into the Constitution, but they did). The states sent some of their finest minds to the Convention, including James Madison, Benjamin Franklin, George Washington, Alexander Hamilton, Gouverneur Morris, and George Mason. These are the men who designed our government and decided which powers it would have. A few of our most important Founders were not present at the Convention. Thomas Jefferson, one of our most prolific and well-read Founders, was in France during the Convention, acting as Minister to that country. John Adams was also abroad, as Minister to Great Britain. Patrick Henry refused to go because he “smelt a rat in Philadelphia.” (referring most likely to Hamilton, who he suspected would try to push a system based on the British system). And also absent were John Hancock and Samuel Adams. (i) The first group was the Monarchists who wanted an all-powerful government modeled after the British system with no power remaining with the states. Its only proponent was Alexander Hamilton. (ii) The second group was the Nationalists, who wanted a strong centralized “national” government and with little sharing of power with the states. Its most vocal proponent was James Madison. The Nationalist plan didn’t receive much support at the Convention. (iii) The third group was the Federalists, who luckily won the day at the Convention. They wanted a federal government of limited powers and the states to retain their sovereign power. [Note that there is a significant different between a “national” government and a “federal” government. A “national” government is a central government of concentrated power. Very little power is left to the states. A “federal” government is one of certain powers with the remainder left to the sovereign states. “Federal” refers to “federation.” A “federation of States” refers to a group of sovereign states. Federalism means the distribution of legislative authority between a central government having jurisdiction over national issues only and local governments having jurisdiction over regional issues]. Madison outlined a plan for a new government. In fact, he arrived at the Convention with a plan that hoped the other delegates would simply and quickly adopt. Luckily that wasn’t the case. The overwhelming number of delegates weren’t willing to give up state sovereignty. They understood that a strong central government could easily become tyrannical and they weren’t willing to trade one tyrant for another one. certain enumerated objects only, and leaves to the several States” the remainder of power over all other objects which the government cannot intrude upon. (5) Representation in Congress would be based on state population. Under Virginia’s plan, the large states would benefit and carry a lot of influence. As it was, under the Articles, each state was represented equally, which made the smaller states happy. The delegates agreed to travel to Philadelphia because most understood that the government under the Articles was ineffective. It lacked enforcement power above all else. The delegates wanted a government with more power but not one with too much power. They felt the People would be best served if power remained with the states, where it was closest to them. Although it was discussed, none of the delegates thought a Bill of Rights was necessary. Within 10 days after Convention wrapped up, a letter was printed in the New York Journal urging the people of that state to reject the new compact. Nevertheless, 3 states quickly voted to adopt the Constitution. Then 2 more states joined in. Massachusetts was torn, but after it was given assurances that a Bill of Rights would be added, it eventually adopted. On June 21, 1788 – 9 months after the Convention – the magical number of nine states was reached and the Constitution was established. New York and Virginia, 2 key states because of their size and power, still thought the Constitution concentrated too much power in a federal government and it was most likely that they would not ratify. And it was highly doubtful that the new Constitution or the new Union would survive without the approval of these states – because if a state didn’t ratify the Constitution, then it didn’t join the Union. So the battle for the Constitution went into high gear. NY and Virginia threatened to destroy the whole plan that had begun at the Constitutional Convention. During the state ratification process, the Anti-Federalist Papers and then The Federalist Papers played a crucial role. Those who supported the Constitution took the name “Federalists” and those who were leery of it and thought it concentrated too much power in a central government called themselves the “Anti-Federalists.” First, the accusations and attacks came from the Anti-Federalists. They published their criticisms, in essay form, under such names as Cato, Brutus, and The Federal Farmer. It is believed that Richard Henry Lee, who presented the formal resolution to the Congress calling for a Declaration of Independence, wrote the Federal Farmer essays, NY Governor George Clinton wrote the Cato essays, and Robert Yates, a NY judge and friend of Clinton, wrote the Brutus essays. [By the way, the concept of Nullification that we hear about, and which author Thomas Woods promotes, comes from the Federal Farmer]. Patrick Henry was another vocal anti-Federalist. The authors of The Federalist Papers were Alexander Hamilton, James Madison, and John Jay. Notice the significance of these authors: Alexander Hamilton was from the hold-out state of New York, and James Madison from the hold-out state of Virginia. The Federalist Papers were a series of essays (85 in total) which explain in detail what each section means and what the intent behind it is. To this day, The Federalist Papers are viewed as the ultimate authority on the intent and interpretation of the Constitution. They were absolutely instrumental in selling the Constitution to the states. Sadly, the Supreme Court over the years has rarely referred to them in interpreting the Constitution. The future of the Constitution and in fact, the future of the Union, ultimately came down to a Bill of Rights. The States thought the government under the Constitution could have a tendency to become too powerful, and therefore they demanded a Bill of Rights. They wanted to make sure the federal government would respect the rights “endowed by the Creator.” It was not until assurances were given that would be added that the states eventually ratified. In a letter dated December 20, 1787 to Madison, only months after the Convention ended, Thomas Jefferson called the omission of a Bill of Rights a major mistake. He wrote: “A Bill of Rights is what the people are entitled to against every government, and what no just government should refuse.” Madison was eventually convinced. By 1788, both Jefferson and Madison would argue that a declaration of rights was necessary to establish the government, and especially the judiciary, as “guardians” of individual rights. In fact, Madison ran for a seat in the first US Congress that year on a platform to include a Bill of Rights. That’s when Virginia and then New York finally ratified. (A bit of trivia: North Carolina would ratify a year later, being one of the last states to join the Union. Rhode Island was the last). The Constitution went into effect on March 3, 1789 and the first Congress met shortly thereafter. George Washington was elected our first President on April 30. And on June 8, 1789, Madison presented his draft of a Bill of Rights, which included a list of 12. After some debate and revision, they were sent to the states for ratification and 10 were adopted. The Bill of Rights, as the first 10 amendments to the Constitution, was officially ratified by the states on Dec. 15, 1791. We all know what is written in the Constitution. Originally written, it fit 4 printed pages. Add the Bill of Rights, and it is 5 pages. It lists the specific powers granted to each separate branch of government. It sets limits on their power by delegating only specific responsibilities. For example, Article I lists only 17 powers – plus the “Necessary & Proper” clause – for the Congress. It sets forth how to amend the Constitution, if the people are so inclined. (Article V). It lists those rights that our Founders considered so fundamental to our humanity and so important with respect to government that the government must protect them (the Bill of Rights)… just as the Magna Carta, Petition of Right, and English Bill of Rights had laid out in England. [NOTE that The Bill of Rights does NOT grant any individual liberties. It simply lists those rights that government must protect. The Constitution is the foundation of our nation. It is the great guarantee of liberty. Again, together with the Declaration, they constitute the charter of our freedom. It is OUR document. It is our document to limit government and NOT the government’s document to try to regulate US. The Convention of 1787 produced the most enduring written Constitution ever created by human hands and human minds. In fact, the United States Constitution is the oldest written constitution still in use by any nation in the world. (4) All other power that the government has comes from the consent of the governed (the people). The Declaration of Independence is the value system on which our Constitution was based. When you think of the United States, you think of Liberty. Americans enjoy a great deal of personal liberty. People around the world know we enjoy fundamental human rights, we believe all men are created equal, we have equal rights, and we have a Constitution that vigorously protects all these. I think it’s important for every person who values individual liberty to understand how our Founders secured those liberties for us. government. All of these principles have one goal in common — to promote individual liberty). 1. ACKNOWLEDGEMENT OF A CREATOR. As a nation, we believe in and acknowledge a Creator. Our rights are linked to a Creator and not to a benevolent government. “We hold these truths to be self-evident, that all men are created equal, that they are endowed with certain unalienable Rights, that among these are Life, Liberty and the pursuit of Happiness. — That to secure these rights, Governments are instituted among Men, deriving their just powers from the consent of the governed…. jurisdiction. Jurisdiction explains where the state has power over the individual. If individuals are simply “endowed with certain unalienable rights,” the government can easily step in and say something like this: “Since you are born in the United States, the US government will dictate what rights you have.” If individual rights come from the state, then the state can regulate them or take them away. Our Founders understood this. They studied the oppressive regimes of history. Our Founders believed that certain human liberties are so fundamental to one’s existence, humanity, and individuality that they must come from our Creator. If that is the case, then no government can take them away. Natural law is also the basis of individual sovereignty. Natural law (and individual sovereignty) form the foundation for the Bill of Rights. Natural law is what spontaneously arises when there is no government, because of “who we are” and who created us. Natural law derives from the nature of man and the world, just as physical law derives from the nature of space, time, and matter. 1). There is an order to the universe: There is a Creator who created the universe then created people. People, in turn, form into communities, and in order to keep their communities ordered, they establish local governments. Finally, local governments give rise to central governments. [It’s like: What came first.. the chicken or the egg?] Natural law is what spontaneously arises when there is no government, because of “who we are” and who created us. 3). This higher power which created the universe also endowed humans with a bit of its own divinity (We are Created in His Image; that is, He gave us the powers of speech, intelligent thought, reason, and wisdom. We love and nurture our young; We build life-long family units). 4). As a result of this “spark of divinity,” humans are and should be (forever) linked to their Creator and should honor this relationship. 5). Because humans share reason with this higher power, and because this higher power is presumed to be benevolent, it follows that humans, when employing reason correctly, will also be benevolent. 6). Reason and benevolence (termed “right reason”) is therefore the foundation of law. When this is applied in a society, it is JUSTICE. It operates best when men are virtuous and honorable. It fails when men are greedy and depraved. inalienable rights endowed by our Creator without government interference. Daniel Webster explained: “Liberty exists in proportion to wholesome restraint.” This is not to saw that liberty is something that needs to be controlled or restrained (especially by government). Webster understood that while God gave us our liberty, he set limitations on our conduct (set out in the Bible). So “wholesome restraint” is that which comes through religion, morality and ethics. Constitution. There is a reason the Constitution is written on behalf of us…. Because the power is derived from us. State sovereignty is the supreme and absolute power vested in an independent state to regulate its internal affairs without foreign interference. Strong states are best to protect the rights and address the concerns of the People, especially by checking the power of the government. The primary role of government is to protect the sovereign rights of the People. Our Founders took this concept from John Locke. John Locke took the Cicero’s concept of Natural Law one step further and applied it to government. According to Locke, people (not rulers or governments) are sovereign. Individuals have sovereign rights which no government can take away. As such, government is morally obliged to serve people, namely by protecting life, liberty, and property. He explained that natural law tradition could be observed with the ancient Jews and in fact, the design and purpose of government was influenced by the ancient Israelites. Unfortunately, when laws become too numerous and detailed, they can destroy liberty just as surely and effectively as having no law. Federalism is a sharing of power. Our Founders assigned specific powers to the “federal” government and left all remaining powers with the states. That is why it is called a “federal government,” as opposed to a “national” government. This sharing of power is memorialized in the 10th Amendment. Its purpose is to protect individual liberty by controlling the bounds of government. It’s a very important part of our system of “check and balances” on government power. Power closest to the people is most responsive to the people. 1. Our nation was intentionally set up as a republic rather than a true democracy. It is a Constitutional republic because the Constitution is the Supreme Law of the land. 2. It is a nation of laws and not a nation of men. 3. A pure democracy is the Rule of Men. It is mob rule. In a democracy, any group of individuals composing any minority group has no protection against the unlimited power of the majority. 4. With a republican form of government, on the other hand, there is a degree of insulation between the people (who might try to rule in a frenzied mob style and deny rights to minority groups) and government rule. The purpose is to control rule-making… to make sure it’s done in a calm, deliberate, and thoughtful manner. 5. Its purpose is to protect EVERY individual’s God-given, unalienable rights. 6. Our particular republican form of government is based on a separation of power because our Founders understood the inherent weakness and depravity of man and the tendency for power. This was the argument Madison made in The Federalist No. 55. 9. LIMITED GOVERNMENT – (Again the Founders relied on John Locke, and thousands of years of history). The powers of the government are limited and clearly defined. The states ratified the Constitution in reliance on the promise to respect state sovereignty and to form a government of limited and defined powers. in order to the keep the states in control and to keep power closest to the people. To Madison, the Constitution was written as a social compact in which “We the People” granted specific, limited powers to the federal government. powers. The state ratifying conventions are also another great resource. Only a limited government can effectively secure individual liberty. “To take a single step beyond the boundaries drawn around the powers of Congress, is to take possession of a boundless field of power, no longer susceptible of any definition.” – Thomas Jefferson. Jefferson instructed us that the Constitution should always be construed in favor of a limited government. 10. SEPARATION of POWERS (providing a System of Checks and Balances). branched form of government and through a series of checks and balances. 1). The Separation of Powers doctrine was inspired by Montesquieu and John Locke. 2). It calls for a division of authority among different branches of government. One branch (the legislative) makes laws. A second branch (the executive) carries out the laws, and a third branch (the judicial) interprets the laws. 3). Each branch has a discrete and defined area of power and there is a clear separation of functions between them. 4). The separation of powers is a constitutional principle designed to prevent the accumulation of excessive power in any one branch. 5). Because the branches are separate, they act to check each other when one tries to assume power that doesn’t belong to it. It reduces the risk of tyranny and abuse from the government as a whole. 6). Separation of Powers ensures that each branch operates within Constitutional limits and doesn’t become destructive of Constitutional aims and destructive of individual liberty. 1). The Founders embraced the economic philosophy put forth by Adam Smith (in his book Wealth of Nations published in 1776) which is the capitalism system we have today. 2). It is a philosophy that essentially keeps government out of the market system and explains government protection of patents and useful arts. 3). Smith wrote that the most efficient economic system is driven by supply and demand and by pure competition. 4). It is also driven by self-interest and rightful rewards. 5). Smith believed that the “free market” system would work most effectively in the absence of government interference. 6). He wrote that individuals acting in their own self-interest would naturally seek out economic activities that provided the greatest financial rewards. Smith was convinced that this self-interest would in turn maximize the economic well-being of society as a whole. 7). Finally, he argued that true wealth of a nation did not lay in gold but rather in the productive capacity of all people, who are properly motivated (rewards risk-taking and investment) and who work hard, each seeking to benefit from his or her own labors. We would hope that’s still true. ideal on which our nation was founded – Individual Liberty. As long as we grateful for these liberties, understand how they are firmly protected (education), and are willing to defend them against a growing government, then we can enjoy the sunrise.